Although classic sizes will always be in demand we know that styles will always fluctuate and change. That is why we offer picture mounts cut to size. 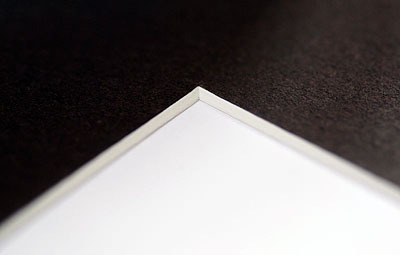 We offer mounts in all the standard frame sizes - as we know these are just about standard throughout the industry. However the internal apertures will always change depending on customers individual and specific requirements. "frame size / aperture" and then we list all the available options. So for example - if you had a frame size 12 by 16and wanted a specific aperture size , you would select the option 12x16 - Bespoke - and then in the "Bespoke internal size - EXACT SIZE" simply tells us the exact aperture size eg 5x4 inch. Remember though we will cut exactly to the size you tell us. As always - if you are in any doubt - just give us a call , drop us a line and we'd be happy to help. Cadremont Picture Mounts are unique in that they are cut to a 45 degree angle whereas other manufacturers can only cut to a 37 degree angle. Why does this make a difference ? By using a steeper angle it gives much more depth to your artwork helping it stand out - and all our customers agree.